I think I mentioned that I'm trying to grow radishes in containers this year. I've had success growing them directly in the ground in years past. 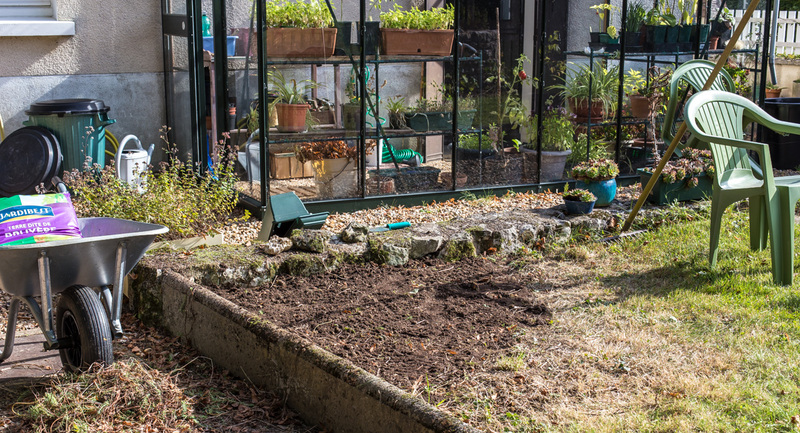 The problem with that is that snails and slugs like to munch on the part of the radish that rises above the soil, making them much less appetizing at the table. I'm hoping that by growing them in containers inside the greenhouse, I can avoid that. The snails and slugs won't starve. Newly sprouted radishes in planter boxes. On Thursday, I also planted some hot pepper varieties. We got a nice little crop in the greenhouse last year, so I'm hopeful we'll be able to repeat that this year. The back yard always looks so nice when the new leaves come out and the grass is vibrant green. 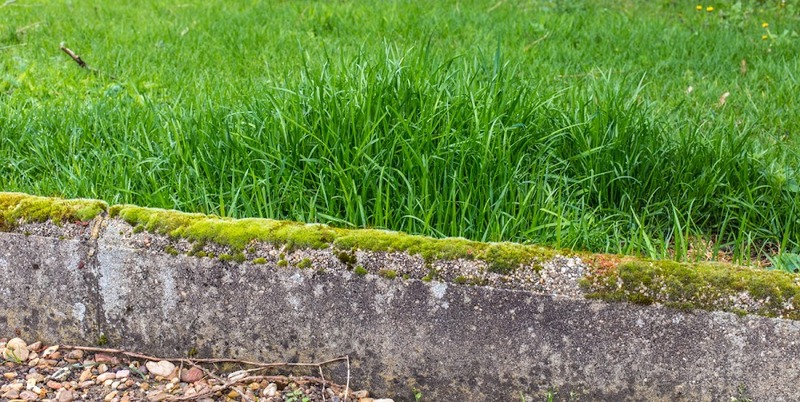 In summer, the grass can get brown if it's hot and dry. I don't like to water it, so that's the way it is. But this time of year it's almost lush. The "West 40" looking toward the northwest. The low hedge on the right is hazelnuts. 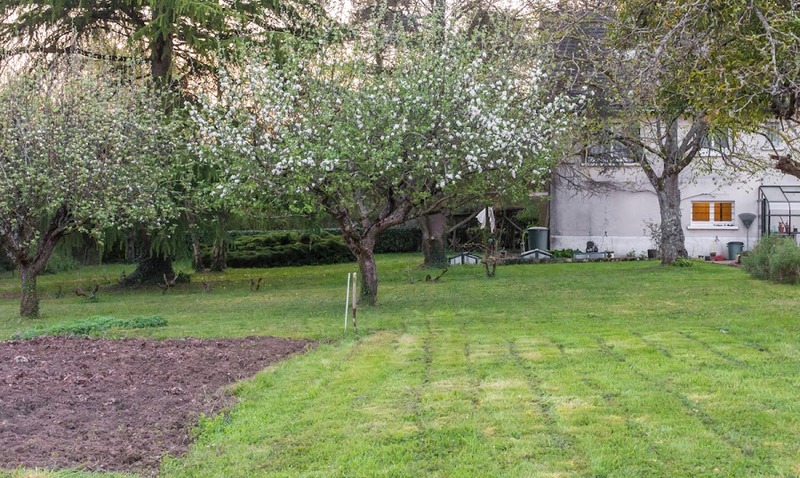 In the back corner you can see the red leaves of the plum tree that Ken planted some years ago. The big apple tree on the left is not long for this world. It's full of mistletoe (a parasite), it's lost several big branches in recent years, and the main trunk is splitting down the middle. The other two apple trees on the right were pruned back two years ago and are looking pretty good. In the foreground is a row of sage plants and our artichokes. The little green mounds by the garden plot are oregano, which I'll be able to harvest and dry in the next week or so. Ken is doing a great job tilling up the vegetable garden plot. It will be ready to receive the greenhouse seedlings in mid-May. 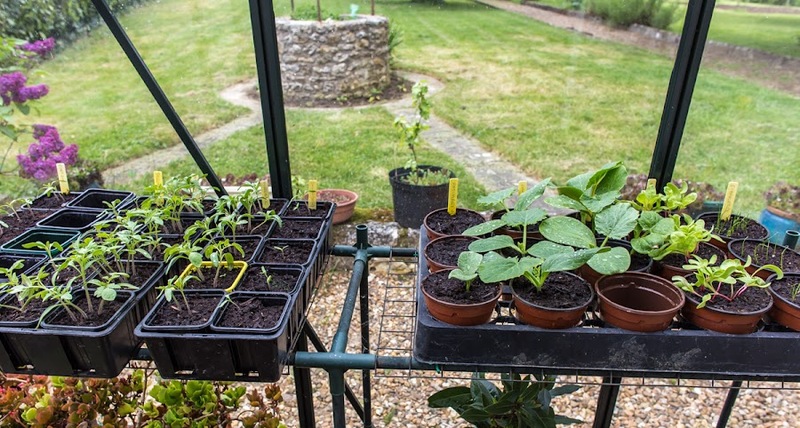 I've already planted seeds in the garden for climbing beans and snow peas. Those should sprout in the next few days. The seeds I planted are coming up, mostly. This year I planted five varieties of tomato: cœur de bœuf, homestead 24, corazon, yellow perfection, and fireball. They've all sprouted, some better than others. My plan is to put five of each variety into the garden in May. Tomatoes on the left, squashes on the right. I also have zucchini, potimarron (red kuri squash), and a large red pumpkin. Not to mention Swiss chard. For herbs, I've planted more chervil and some chives. Soon I'll put in some cilantro. This year I put some radishes into planter boxes to see how that works. When I plant them in the ground, they do well except that the snails and slugs like to nibble on them. Soon I'll plant some basil seeds for the greenhouse. I love spring! The common dandelion gets its English name from the French term dent-de-lion. Apparently the leaves resemble the shape of a lion's tooth. Another French name for the weed plant is pissenlit (piss in bed), a fifteenth century term that refers to the plant's use as a diuretic. 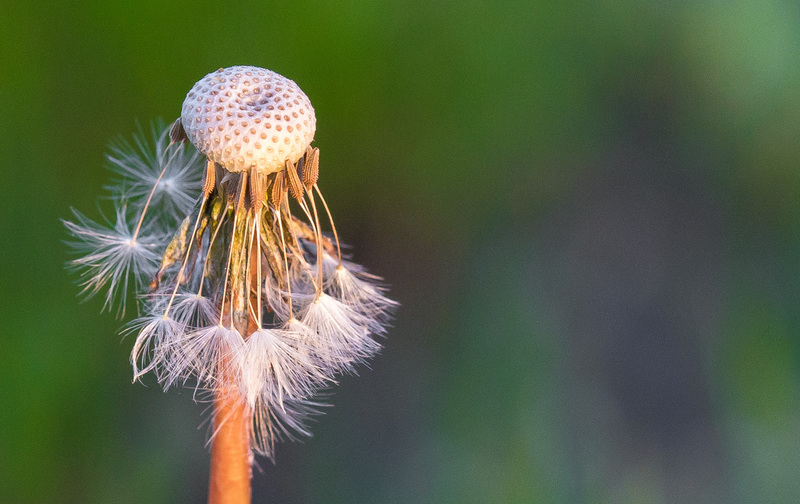 A dandy lion holds on to a few seeds for just a little longer. Whatever you call them, they're in full bloom all around us now. Many, like this one, have already lost their feathery seeds to the wind. I remember dandelions as summer lawn pests back in the US, but around here they're out in great numbers by early spring. Not being an expert on spiders, I couldn't tell you if this is a male or female, or even what kind of spider it is. It looks like a European garden spider that I saw on the internet. The web was pretty big, about a foot across, and the little spider was sitting right in the center. There was a good gap between the outer circles and the inner circles where the spider sat. 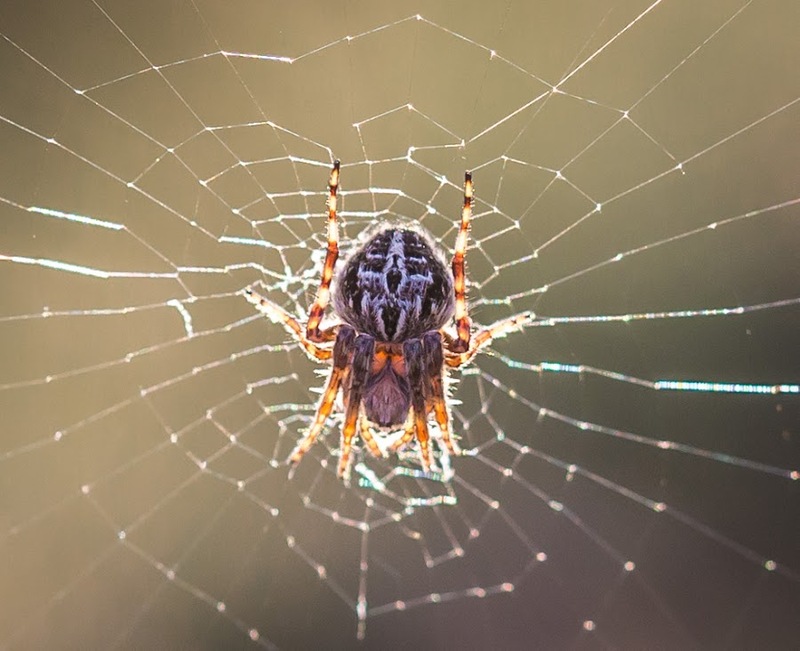 A spider either warming itself up in the morning sun or waiting for an unsuspecting insect to visit the web. It was a week ago today that I started cutting our grass. And now it's time to do it again. Today's weather should be good for cutting. If I wait too long, the grass will be too long. Better to get another cut done while it's still manageable, no? And speaking of asparagus, I spied a few "wild" spears out among the grape vines on a recent walk. These are not what's officially called and sold as wild asparagus. They're normal asparagus that have "escaped" into the wild. The vineyards out back are dotted with many asparagus plants. 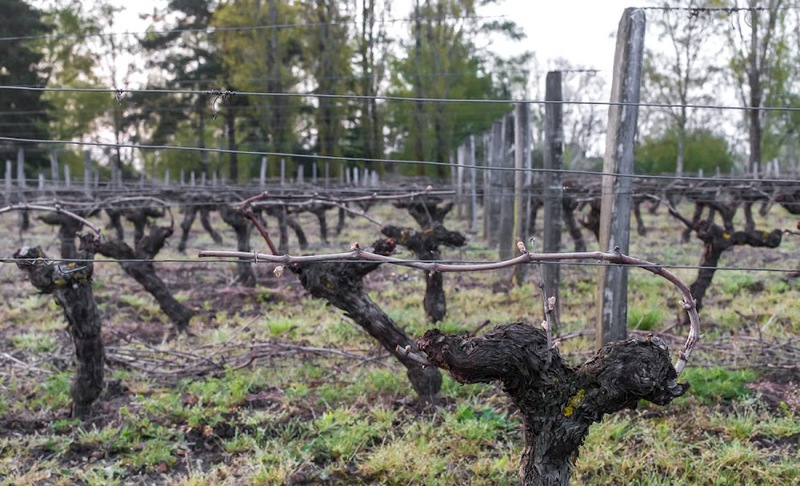 They grown in line with the vines, where plowing and mowing can't reach them. I assume the seeds were scattered by birds from fields where asparagus is grown commercially, or from home gardeners' asparagus beds. A "wild" asparagus spear growing out in the vineyards behind our house. These rogue spears are always green because they poke up out of the ground into the sunlight. Unless someone (like me) picks them when they first sprout, the spears grow up and mature into rather large plants that flower and set seed. I used to know where many of them grew, but I've since forgotten. These days I find them later in the season when it's too late to pick them. The asparagus guy at Saturday's market had his stand set up and was selling asparagus. Our local asparagus is white and sometimes what they call violettes (violet, like these). It's the same plant as green asparagus, but the spears are grown under dirt so that they don't get any sun and can't photosynthesize. When allowed to grow up into the sunlight, they turn green pretty quickly. White asparagus that are allowed a minimum exposure to the sun develop a hint of purple color at the tips and are called "violettes." The price was high at nine euros/kilo. That works out to about US$5.50/lb. Over the next few weeks, though, the price should fall as more and more asparagus becomes available. Unlike green spears, the white asparagus has to be peeled before cooking. The skins are fibrous and inedible. I'll steam these to get them close to done, then finish them off on the grill. Yum! 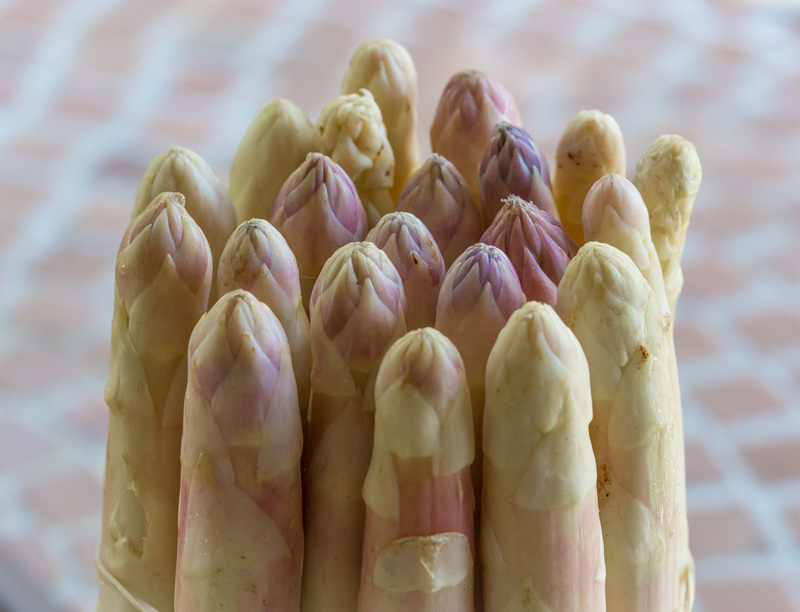 The same guy who sells these asparagus sells his locally-grown strawberries, too, but they're not ready yet. Another couple of weeks for those. I saw strawberries for sale that were grown in Spain and others from the Lot-et-Garonne (just south and east of Bordeaux), but I prefer the local stuff, so I'll wait. The tulips I planted last fall were a big success, but now they're beginning to fade. The flowers are opening wide and the petals are drooping and beginning to fall. But coming behind them are the blue Rozanne geraniums. They're getting bigger, but it's too early for flowers right now. 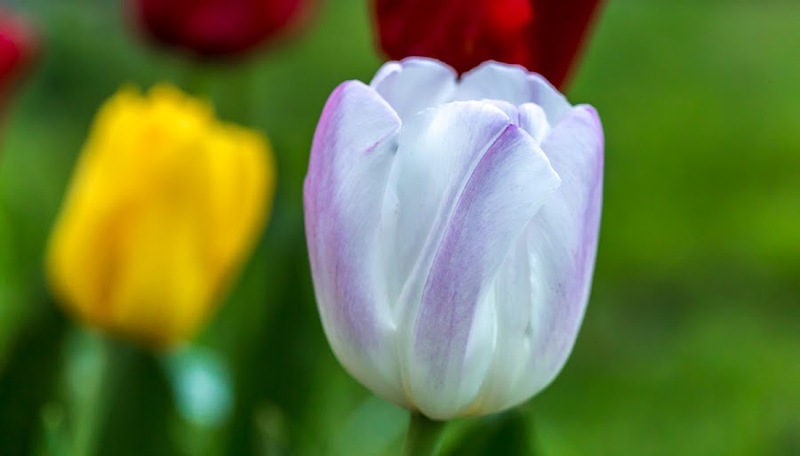 Some of the tulips, like this one, are still looking good. But not for long. 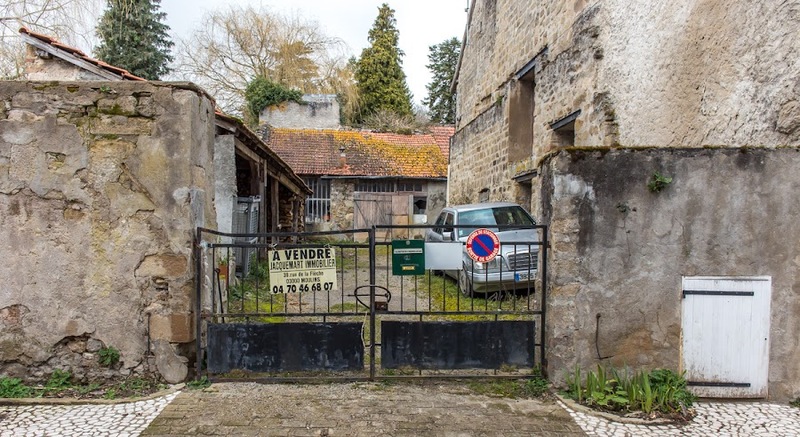 I'm going to the market in Saint-Aignan this morning to see if the guy that sells his locally-grown asparagus this time of year has any yet. The first asparagus of the season can be a little pricey, but the price comes down pretty quickly. We've seen asparagus in the supermarkets already, but it's likely that it's coming from other regions to the south. Tasha's just over a year old now, but she still exhibits certain puppy behaviors. Some are cute, some are annoying. 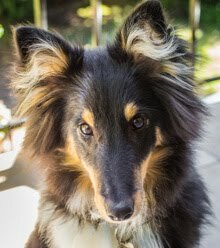 We don't do any rigorous training with the dog, but there are still things she needs to learn and we work on them using praise and correction. A good growl or bark from one us will stop Tasha and put her in a down-stay. Temporarily. Tasha on one of her favorite paths through the woods. She still likes to nip at my heels, especially in the morning. I have to be more aggressive about stopping that. She's learned to be pretty good on our off-leash walks, although I need to reinforce the stop, come, and stay commands. She really wants to follow vehicles on the dirt road and that's not good. Overall, though, things are going well. We'll continue to work on our commands and play skills through the summer months. I don't want to jinx it, but it actually feels like summer this week. And the good weather is predicted to last through the weekend. I got the first section of grass cut yesterday. It included the tallest, thickest patch of overgrown grass in the yard, so that's the South 40 done. The next section, what I call the West 40, will get done today. Then the North 40 will be finished tomorrow (unless I have a great burst of energy and do it today). I don't have any new photos of the yard, so this shot of a pruned grape vine parcel at sunrise will have to do. I also got some flower beds cleaned up and planted some herb seeds in a third bed. Last year's cerfeuil (chervil) reseeded itself and we've already used some in the kitchen, but I added some more seeds for a second crop. I also have vegetable seedlings sprouting in the greenhouse. It feels good to be outside getting the garden and yard cleaned up and trimmed instead of just watching it languish under rainy skies. It looks like the pruning in the vineyards is winding down. Right now the workers are wrapping the single remaining canes around the horizontal guide wires and fastening them in place. New growth will rise from the buds along those canes. Pruned, tied, and ready to grow. You can see some of the pruned canes on the ground waiting to be mulched. The canes that were pruned off have been lined up on the ground between the rows, and now they're being ground into mulch. It won't be long before the green leaves sprout. On the home front, I'm ready to start cutting grass today. The sticks and branches are all cleaned up and the machines (lawnmower and rototiller) have fresh motor oil in them. I may have to get the weed-eater out to cut down the tallest and thickest grass before running the mower over it. All the rain of the past months has not just made the ground soggy, but has also made the grass (and weeds) grow quickly. 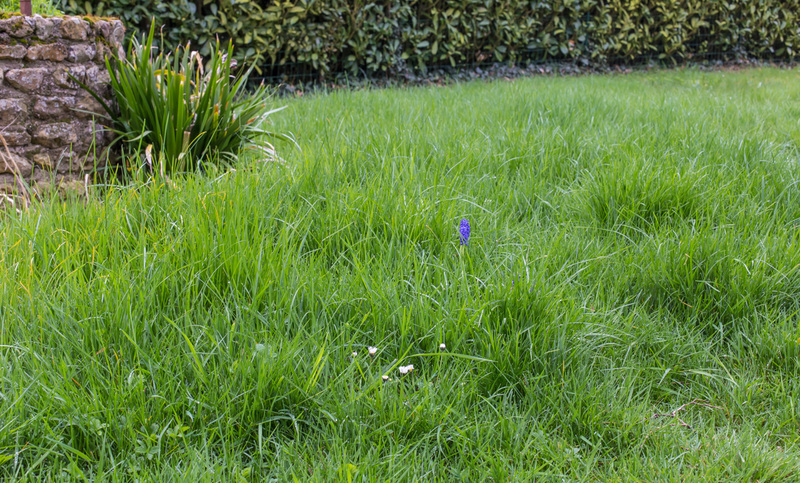 It's been too wet to get the lawnmower out, so the grass continues to get tall. I may get my chance this week, though. The weather people are predicting a dry and warm spell, at least for a few days. I hope they're right. This is one of the sections of the yard with more grass than weeds and wildflowers. It'll be tough to cut. I'm going to have to get out there before the grass gets any taller. In places, it's already a foot tall. That's going to be difficult for the mower, but not impossible. I'm thinking that today I will get out there and pick up the fallen branches so that the yard is ready for cutting. I also want to change the oil in the mower before I use it. Another section of tall grass. Ken is itching to get out into the vegetable garden plots to till, so I will change the oil in the tiller as well. If the ground dries out this week, he'll have a small window for tilling before the next rain system moves through. We're keeping our fingers crossed! Here is my parting shot: the village of Juliénas, one of the northern-most towns in the Beaujolais Villages appellation. We stopped at a wine co-op that we learned about on the internet and came away with about eighteen bottles. Yum! The village of Juliénas seen from the wine cooperative just south of town. After the co-op, we drove up into the village and found a nice café overlooking the vineyards. The sun was shining and Tasha sat with us while we enjoyed a coffee. It was the second café she got to visit on our little trip. The very thoughtful waiter brought over a bowl of water for her. After our coffee, we got back in the car and headed out for the ninety-minute drive back to our rental house. 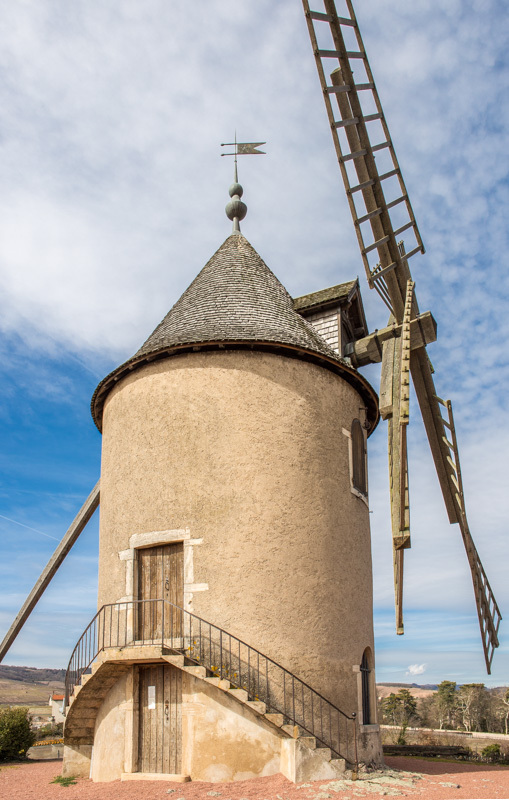 Here are just a few more images of the moulin à vent (windmill) of Beaujolais fame. To enter the windmill in winter is the impossible dream. During the summer months, the windmill is open to visitors. I wonder if it ever operates? 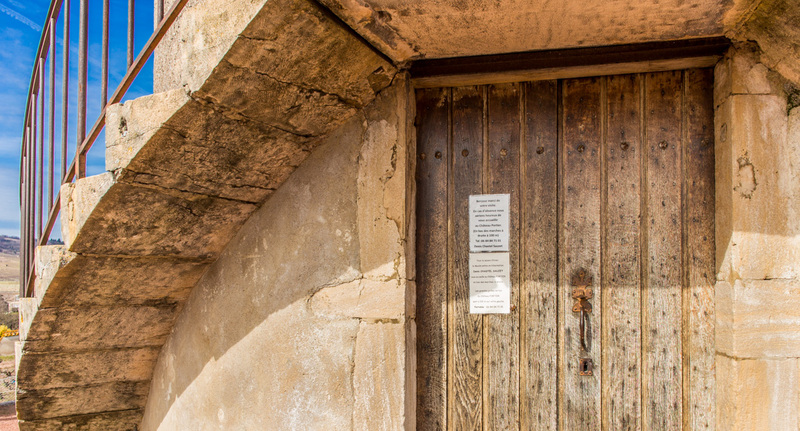 A door at ground level with a note to tourists. 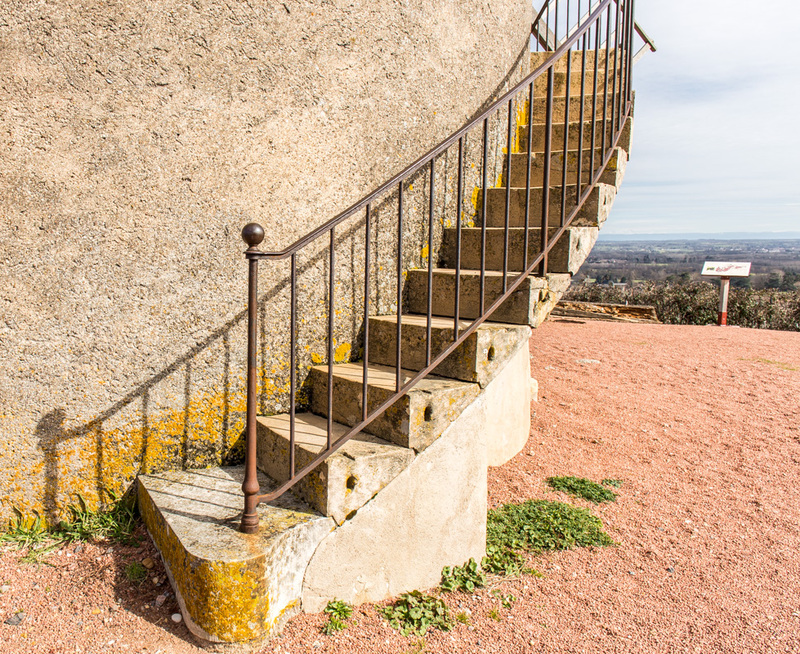 Two of these curved stairs climb up to a second door above the first. And finally, a long shot of the whole building. That's French for "windmill." 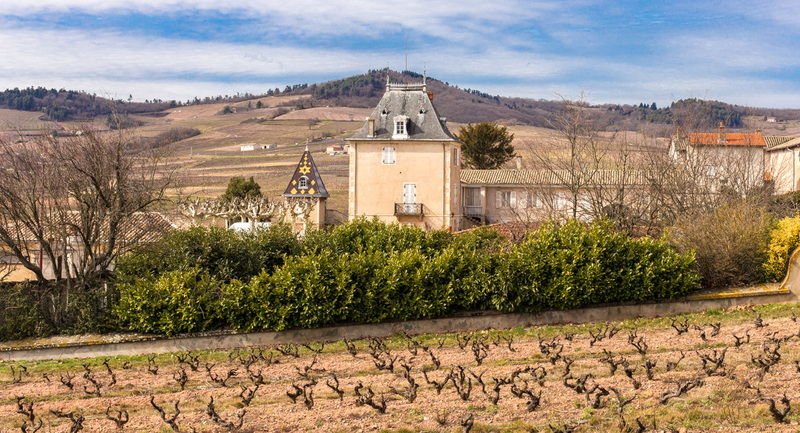 This one stands on a hilltop overlooking the vineyards of Beaujolais and gives its name to one of the special crus of Beaujolais. We stopped here and walked Tasha up the short walkway to the foot of the windmill and took in the views. Unfortunately, we were too early for the cave to be open -- they were still closed for lunch. But it's probably for the best. We already had some wine in the trunk and we had several more villages to visit on our way north. 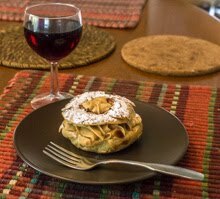 Beaujolais is more expensive than our local Touraine gamay so we didn't need to go overboard. By the way, un caveau is une petite cave (a little wine cellar). Clear? Not. The wine cooperative at the foot of the windmill, closed for lunch. But it was nice to see the windmill. 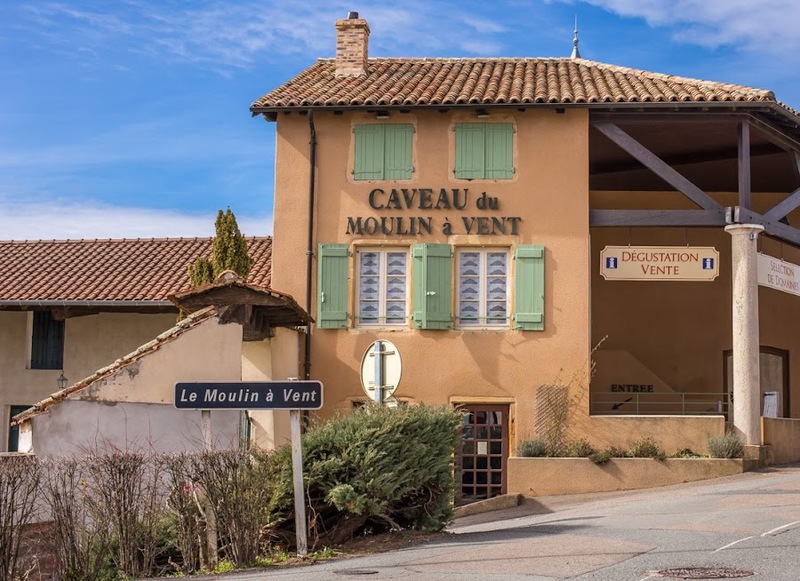 I had always assumed that Moulin-à-vent was a town, but it's not. It's just the windmill, which is classified as a historical monument, and the name of the wine made in the neighboring vineyards. Nearby buildings and surrounding vineyards. 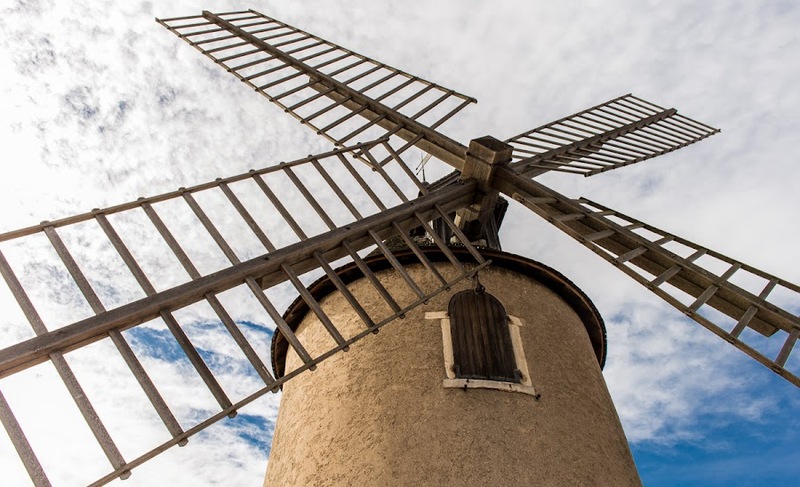 A grammar note: when moulin à vent is written without hyphens, it refers to a windmill, any windmill. 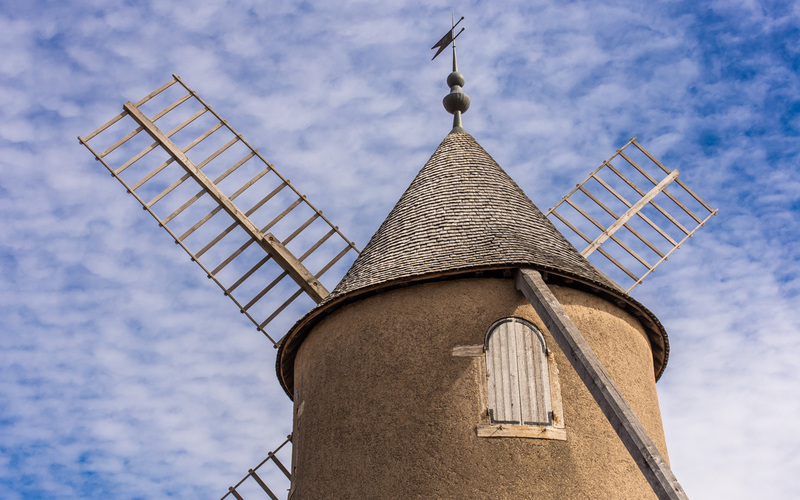 When the three words are hyphenated, Moulin-à-vent, it's a proper noun that refers to the wine appellation. At least that's my understanding. 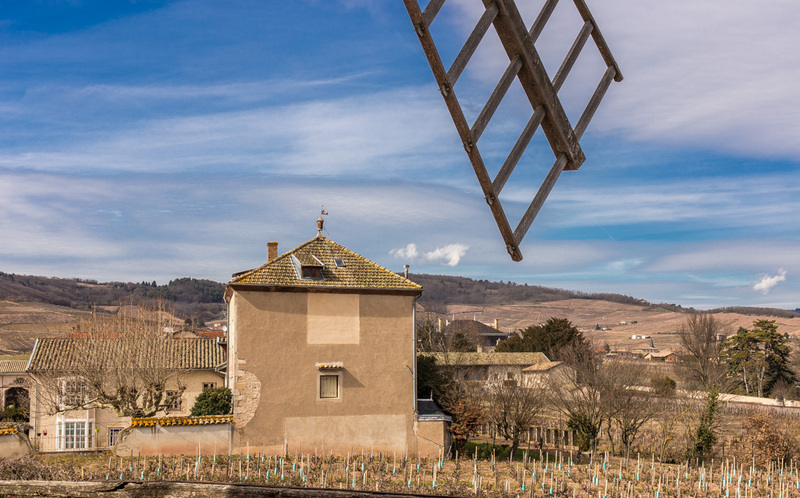 Our first stop in Beaujolais was the town of Régnié-Durette. We didn't find a roadside picnic spot between Beaujeu and Régnié, so we decided to go to a wine cave in town before things closed for lunch. Ken went in and tasted while Tasha and I explored the town's main square. 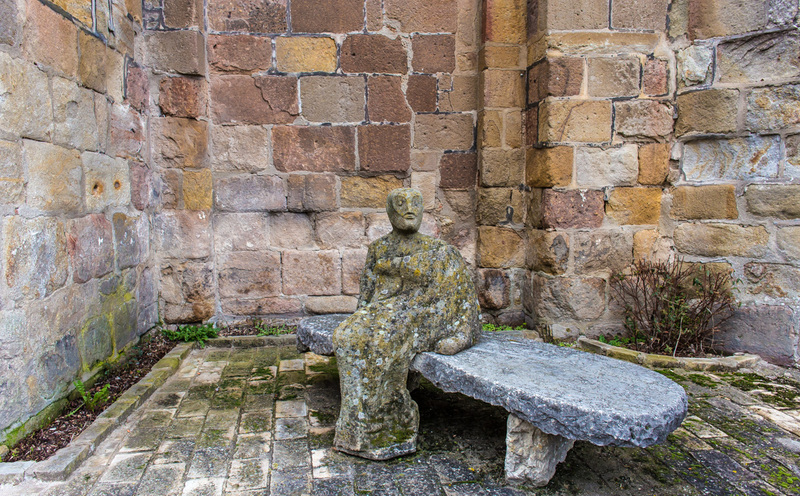 We walked around the church to see the view and found a single picnic table just beyond the apse. Tasha contemplates the view out over the vineyards of Beaujolais. We made our way back to meet Ken as he was coming out of his tasting with six bottles of Régnié Beaujolais. We put that in the trunk, retrieved our little cooler and picnic supplies, and made our way back to the picnic table for lunch. I attached Tasha's leash to the table. 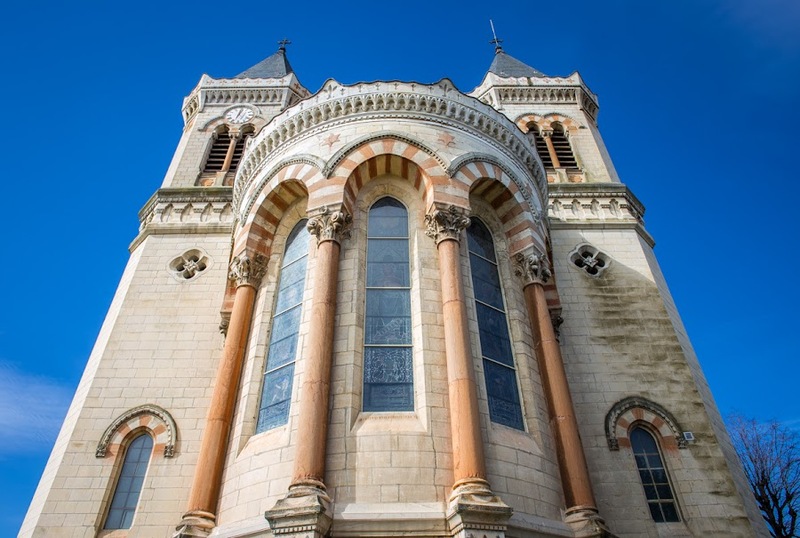 We had our picnic in the shadow of Régnié's church, Saint-Jean-Apôtre, built in 1867. Ken had made turkey salad sandwiches that we enjoyed with some tortilla chips and a bottle of the local wine. The sun was out and we the view was great, but there was a brisk chilly wind and it wasn't comfortable to sit for too long. Still, our mission was accomplished and we got back to the car and planned where to go next. 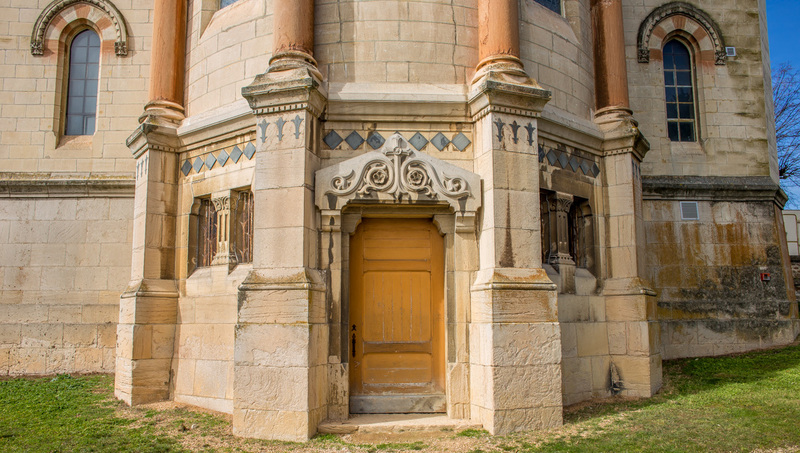 I'll bet that this door leads to the crypt below the main floor of the church. 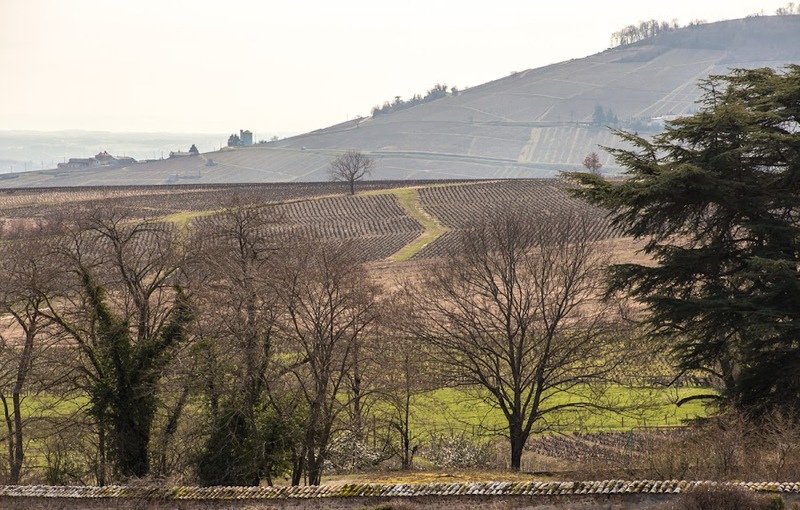 The map showed a route that made its way north through several of the Beaujolais villages, so we headed in that direction. ...to bring you tulips! 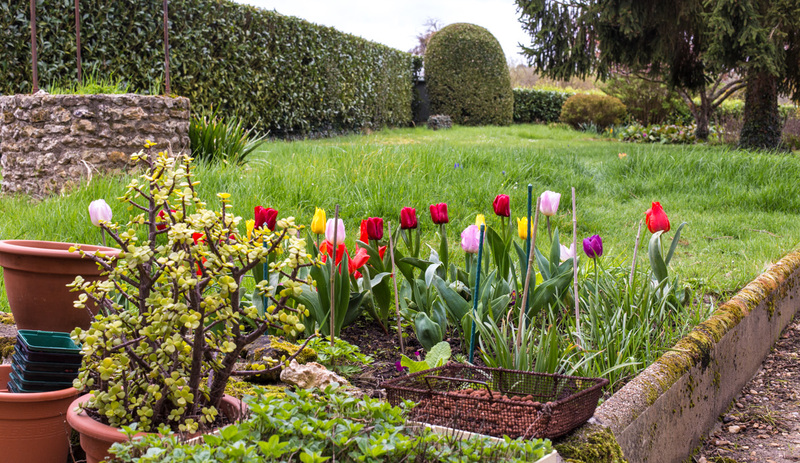 I'll get back to Beaujolais tomorrow, but I wanted to get in a photo of the new tulips blooming out back. You might remember that last fall I dug out some overgrown lavender plants in a triangular bed along our walkway. I amended the soil, and then planted bulbs. I had some miniature daffodils in a pot, so I divided those into three parts and planted them. Then, I had some perennial Rozanne geraniums, also in pots, that needed more space, so into the ground they went. Finally, I got some tulip bulbs from the garden center and added those. First year tulips. Some of the newly sprouting geraniums are visible on the left next to the brown bamboo stakes. The daffodil bulbs did great and, even though they got snowed on, they bloomed through March. Now it's the tulips' turn. This is their first year, so I'm hoping they'll do even better in the years to come. The geraniums are sprouting now and should take over the plot as the tulips die back. They produce nice blue flowers that last into the fall. 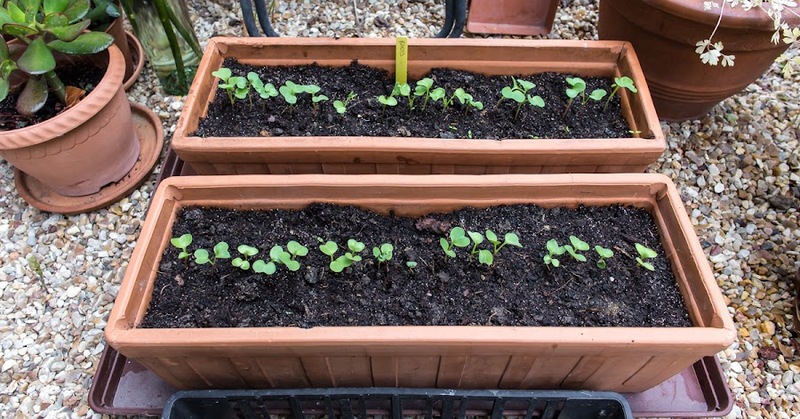 They didn't really thrive in pots; probably too confining. So I'm hoping that they will enjoy being in the ground. 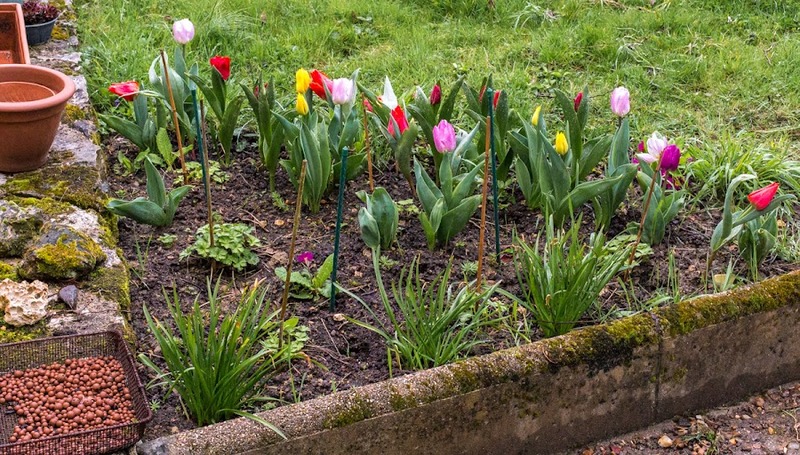 This is the spot last October, after I had dug out the lavender and amended the soil, but before I planted the bulbs. Finally, there are three amaryllis bulbs in the mix. They were also in pots but are now in the ground. There is some green just now poking up from those bulbs, so maybe later in the spring we will see some flowers. I'll keep you posted. 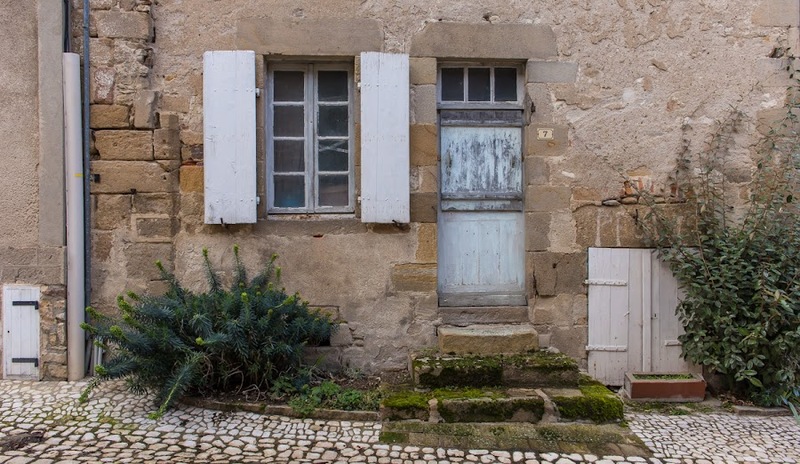 There are only so many doors and windows in Souvigny. But I'm not out of photos of them, yet. So you get one more today before we move on. It's spitting rain this morning, but it's relatively warm outside. On Friday afternoon I pulled out the power washer and cleaned the deck. Then I brought the table and chairs up from the garage for the season. I also enjoyed some time sitting outside while the temperature hit 21.4°C (just over 70°F). Today we're going to a local winery that's hosting its annual open house with winemakers invited from other regions around France. It's fun to taste other wines, and I like to buy Chablis from one of the wineries that participates every year. Chablis is made from chardonnay grown on the hillsides around the town of Chablis in northern Burgundy. Our region doesn't grown much chardonnay (and then it's usually used to blend into sparkling wine), so it's nice to get some at the open house. We can certainly get Chablis in the supermarket, but it's more fun to buy directly from the winemaker. 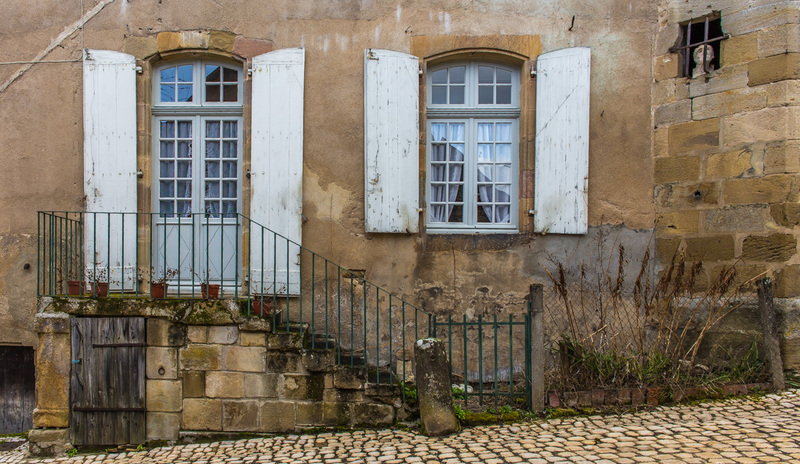 Another doors-and-windows shot from Souvigny for your Friday. There's nothing much to say about it. It's not unusual, nor it is unusually pretty. Just standard stuff. I like all the shapes, textures, and muted colors. Those steps need a cleaning. The moss is probably slippery. Today is supposed to be a very warm day. They're predicting a high of 21ºC (just about 70ºF). It will be the warmest day of the week, with a slight cooling-off over the weekend. We're planning to grill hamburgers for lunch. And, I may just get the power washer out and do the deck! 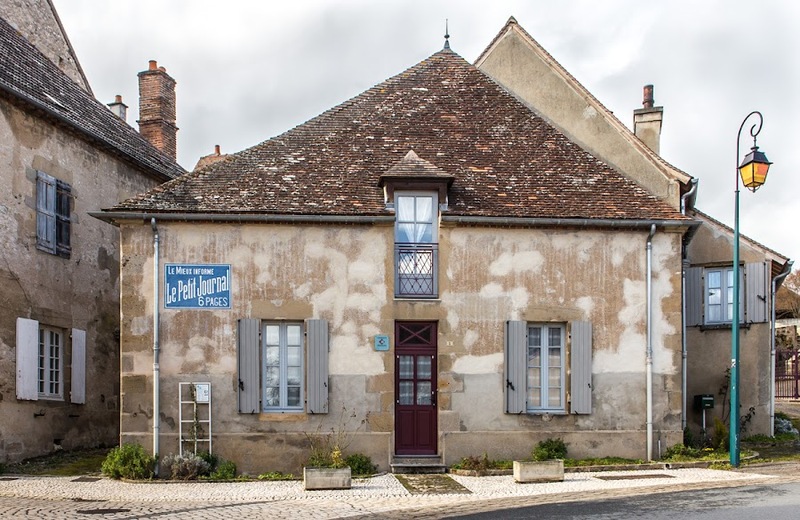 Here's a fixer-upper for sale in central Souvigny. The out-buildings certainly look like they could use a little updating. The main house is pretty austere seen from the street (part of it is visible on the right side of the photo), and I can only wonder what it's like inside. 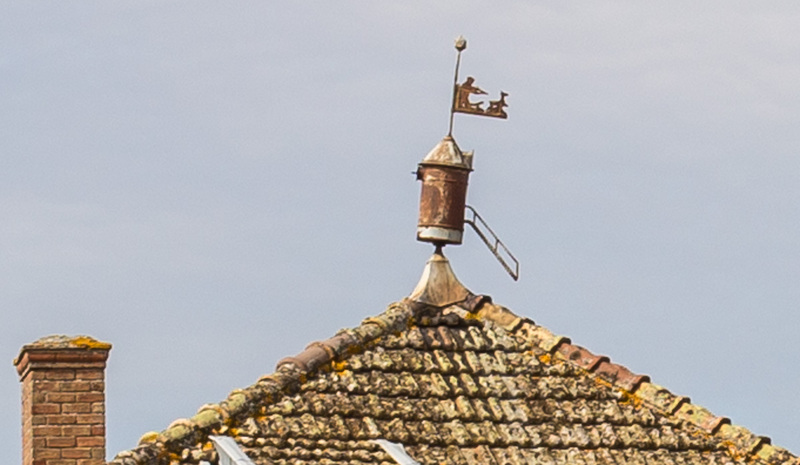 I found the property listing on the real estate agency's web site. There's one exterior photo, nothing from inside. 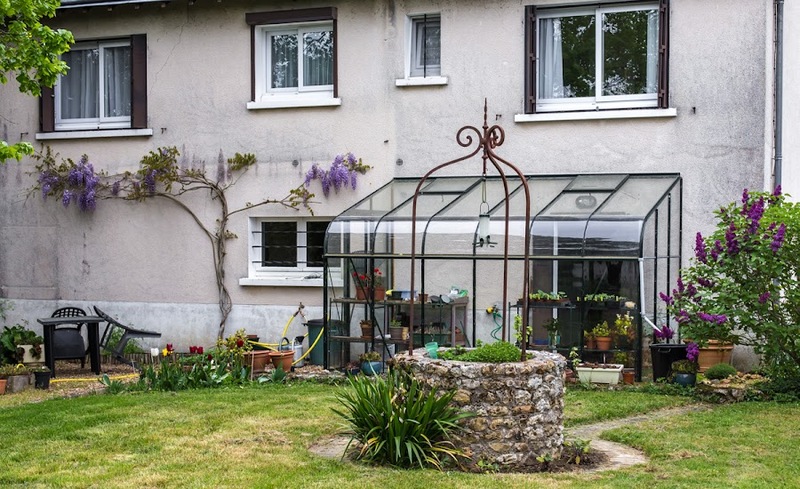 Here's all it says about the property: "ensemble immobilier 320 m² au sol à restaurer - pas de chauf. 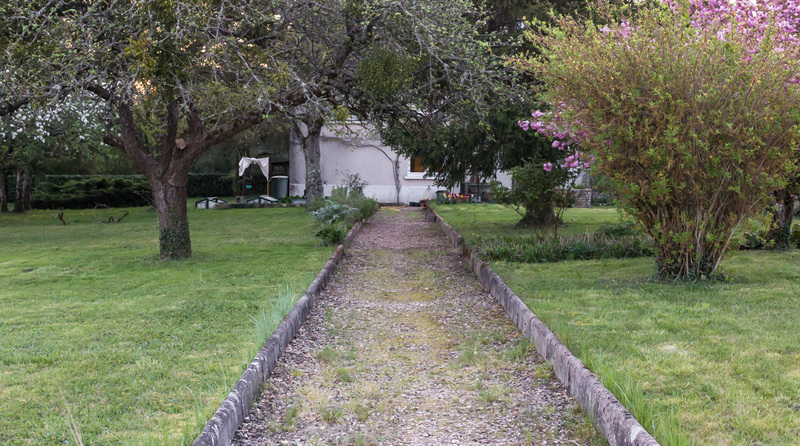 - toiture neuve - terrain 970 m²." That translates as "building footprint 320 square meters (about 3,400 square feet, not including upper floors) needing restoration - no heat - new roof - lot size 970 square meters (about a quarter acre)." It can be yours for a paltry €159,900 (about US$196,000). We're still in Souvigny. I guess I took more photos there than I thought. This spot was toward the end of our walk where the abbey church towers came back into view. The small streets around the center of town had obviously been recently re-paved. 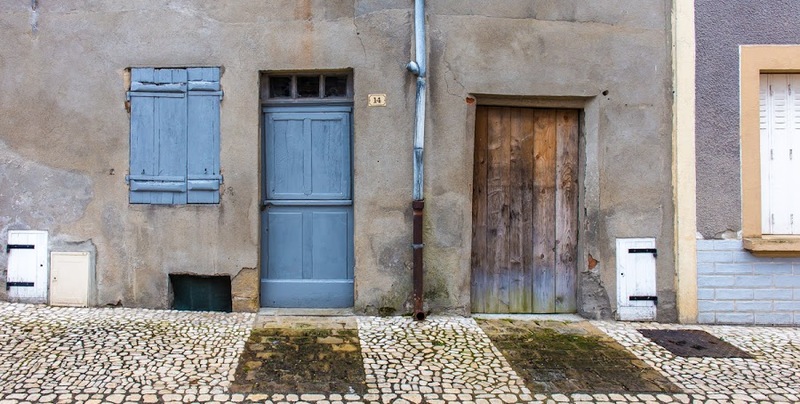 The areas in front of doors and garages are paved differently from the street itself. Cool! Tasha was alert, and she's getting better at being tied to my waist, although we don't do it that often. Still, I had to perform several pirouettes along the way to avoid having my legs bound and falling over. 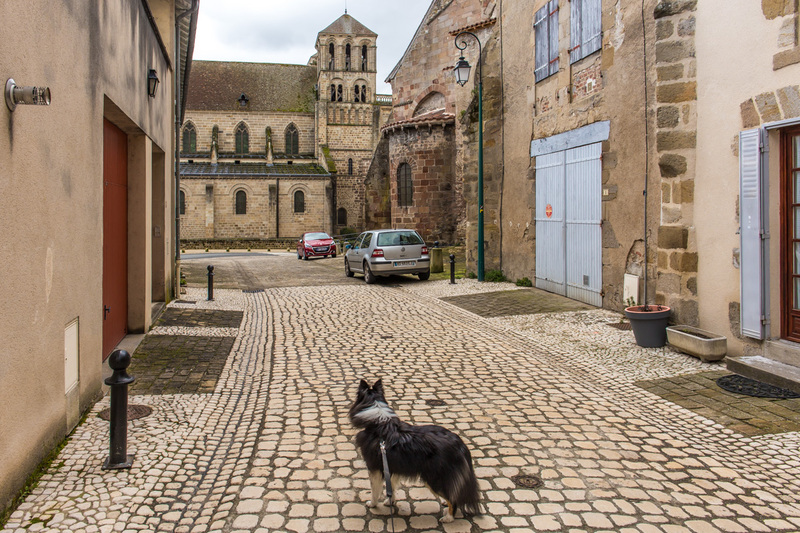 Souvigny is not a big town, despite the impressive abbey and church. There are fewer than two thousand inhabitants -- still bigger than our town, but smaller than Saint-Aignan. As I've said, we didn't encounter many people on our brief walk around the center of town, but there were a good number of cars parked on the main square. Where were the people? A very pretty front door in town. We were there at around 16h00 on a weekday, so people were probably at work. Wherever they were, it was nice to be able to walk around with Tasha without worrying about her getting tangled around some stranger's legs. We did encounter some stone people, like the guy peering out at us from behind bars in the photo. Art or whimsy?